Propeller Brewing Company, Nova Scotia’s largest independently owned and operated brewery, is adding a spring beer to their seasonal rotation. 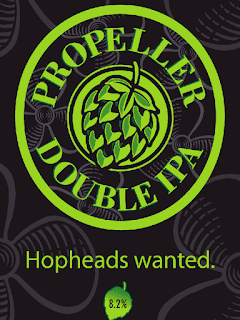 The brewery has announced the release of Propeller Double IPA. Propeller Double IPA is a full bodied, American style Double India Pale Ale that is brewed with premium Pacific Northwest hops and a rich blend of 2-row Pale and Crystal malts. Following fermentation it has been heavily dry hopped (a process that enhances the aroma without imparting bitterness in beer) giving this bold brew its big west coast nose. Double IPA delivers a huge amount of piney, floral, and citrusy hop aroma and flavour from start to finish that is balanced by sweet malt flavours. At 8.2% alcohol by volume and 85 IBUs, Propeller Double IPA is not for everyone… It is a TRUE hop bomb, for TRUE hopheads. This brew is based on Propeller’s most popular One Hit Wonder limited release to date, 2xIPA. Propeller has tweaked this recipe from the original version “It was great to brew what was essentially a test batch.” Says Bobby Zacharias (Brewmaster at Propeller Brewing Company) “It gave us a chance to really get to know the beer and to listen to what our customers thought of it before releasing the final version”. John Allen (President of Propeller Brewing Company) explains “This is exactly what the One Hit Wonder Limited Release Series is all about – having fun, experimenting with styles, and finding something truly spectacular”. Propeller Double IPA will be available March 22nd at the Propeller Shop and soon after at select NSLC Locations and private retailers.